(Robert Louis Stevenson, “The Old Pacific Capital”, Across the Plains with other Memories and Essays [London: Chatto and Windus, 1892], p. 85). On this page you will find information about Robert Louis Stevenson’s travels in California. It was in California that Stevenson married and honeymooned, and also where he spent his last time in the United States before travelling to the South Seas. Because of these emotional and romantic associations, California plays a significant role in RLS’s personal history. On this page you will find details about RLS’s travels through Monterey, in and above the Napa Valley, Sacramento and San Francisco. You will also find details about the Stevenson museums in California: the Robert Louis Stevenson Silverado Museum, and the Stevenson House State Historical Monument in Monterey. (RLS, “The Old Pacific Capital”, in Across the Plains with Other Memories and Essays [London: Chatto and Windus, 1892], p. 77). On 7 August 1879 Stevenson boarded the Devonia at Greenock. The ship was bound for New York and he himself was bound for California to see Fanny Van de Grift Osbourne, the woman who would soon be his wife. He arrived in New York on 17 August. On the following day he began his train journey “across the plains”, arriving in Monterey on 30 August 1879. You can read more about RLS’s impressions of the city in “The Old Pacific Capital” (1880) in Across the Plains (1892). RLS was in Monterey from 30 August – 22 December 1879. Here, he was able to spend time with Fanny Osbourne, her sister Nellie, and Fanny’s children Belle and Lloyd. In September, RLS visited Carmel Valley Village in Monterey County. He camped at a 178 acre angora goat ranch on San Clemente Creek. The owners, Jonathan Wright and Ansom Smith, took RLS in when he became ill. While in Monterey, RLS also started a forest fire. He was fascinated by the many fires that spring up in the Californian forests and wondered whether it was the moss growing on the trees that first caught fire. The moss did catch fire – and quickly spread. RLS later described the incident in “The Old Pacific Capital” (1880). (The Letters of Robert Louis Stevenson, ed. by Bradford A. Booth and Ernest Mehew, vol. iii [New Haven: Yale University Press, 1995], p. 22). Meanwhile, RLS’s friends and parents were deeply worried about him. They were convinced his travelling to the United States and chasing after Fanny was a mistake. Despite their worries and his own health problems, Stevenson was working hard: he worked on The Amateur Emigrant (1895), “The Pavilion on the Links” (1880), and A Vendetta in the West (RLS later stopped working on the novel – the manuscript was probably destroyed). Those wishing to travel in RLS’s footsteps in Monterey can visit Girardin’s French House where RLS stayed. The house is now the Stevenson House State Historical Museum, Monterey (see the Museums section for more details). On 22 December 1879 RLS left Monterey and moved into lodgings at 608 Bush Street, San Francisco (see below). After his marriage to Fanny on 19 May 1880, the newlyweds took their honeymoon in and above the Napa Valley region of California. You can read about their travels in the area in The Silverado Squatters (1884). On 22 May 1880, the Stevensons left for their honeymoon. During their trip they visited a petrified forest and various vineyards, sampling the wines for which Napa Valley is so famous. They also toured places like Mount Saint Helena: “Mount Saint Helena is not only a summit, but a frontier; and up to the time of writing it has stayed the progress of the iron horse” (Silverado Squatters, The Works of Robert Louis Stevenson, Swanston edn, vol ii [London: Chatto and Windus, 1911], p. 176). (Silverado Squatters, The Works of Robert Louis Stevenson, Swanston edn, vol ii [London: Chatto and Windus, 1911], p. 175). 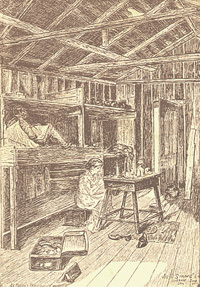 RLS also visited Calistoga in his fiction: his characters Pinkerton and Mamie settle in Calistoga after their business problems in San Francisco in The Wrecker (1892). In Calistoga they stayed in the Springs Hotel (which was later destroyed by fire and rebuilt). They arrived here in late May, and stayed until they went to an abandoned mining camp, Silverado, on 9 June. Unfortunately, at Silverado, Fanny and Lloyd fell ill (RLS’s letters say they suffered from diphtheria). The party moved back to Calistoga and the Springs Hotel to recuperate from 13-25 June before returning to Silverado (with Joe Strong). (Silverado Squatters, The Works of Robert Louis Stevenson, Swanston edn, vol ii [London: Chatto and Windus, 1911], pp. 203-204). They stayed at Silverado from 9 June – late July 1880, in a three-room cabin. In late July RLS and his wife returned to San Francisco (see below). You can read more about their time at Silverado in the page devoted to The Silverado Squatters (1884). You can also visit the Robert Louis Stevenson State Park (a California state park), which covers the area that Stevenson stayed in Silverado. Although the mining cabin is gone, the site is identified on the trail in the park. To learn more visit http://www.parks.ca.gov/?page_id=472. The city of St Helena houses the Robert Louis Stevenson Silverado Museum. You can visit the museum to learn more about the author and his time in Napa Valley. For new and archive photographs of Napa Valley places mentioned by Stevenson see The Silverado Squatters in Pictures (ed. by David Duddles, photography and design by Craig Duddles [Orlando: Blue Pylon Creative, 2008]), available via http://www.silveradosquatters.com/. (RLS, The Amateur Emigrant, The Works of Robert Louis Stevenson, Swanston edn, vol ii [London: Chatto and Windus, 1911], p. 136). RLS passed through Sacramento on 28 August 1879. He was travelling by train from New York to Monterey in order to be with the woman who would later be his wife, Fanny Van de Grift Osbourne. In this section you will find information about RLS’s visits to San Francisco – his first visit in December 1879-late July 1880, and his second and last visit in June 1888. You will also find information about how San Francisco has commemorated the author in the city. Stevenson had an anxious and depressing time during his first visit to San Francisco in 1879: he was lonely and Fanny could not see him very often. He was also worried about his literary career and was trying with difficulty to support himself, Fanny and her children. Furthermore, he was unsure about when he would marry Fanny. At the same time, San Francisco sparked his imagination. He later wrote about it in “A Modern Cosmopolis” (1883 – this was later combined with “The Old Pacific Capital , as “The Old and New Pacific Capitals” [in the Edinburgh and Tusitala Editions]), “The Misadventures of John Nicholson” (1887), “The Bottle Imp” (1891), and The Wrecker (1892). After sailing from Greenock and travelling across the United States in August 1879, RLS lived in Monterey until 22 December 1879. On 12 December 1879 Fanny’s divorce from her husband Samuel Osbourne was finalized. She moved to East Oakland, and on 22 December RLS moved to San Francisco to be closer to her. RLS took lodgings at 608 Bush Street, San Francisco and his sense of isolation and alienation are evident from his letters. He described his typical day in a letter to Sidney Colvin on 18 January 1880. The letter indicates the loneliness and sense of monotony he felt before his marriage. He recorded that every day he left Bush Street between 8:00-9:30AM. He would then walk along Powell Street, cross Market Street and walk to a branch of the Pine Street Coffee House. At the coffee house RLS would dine on coffee, a roll and butter. RLS then split kindling and broke coal for his fire with a little hatchet. Afterwards, he would write for three or four hours. Next, Stevenson would have lunch at Louis Donnadieu’s restaurant on 425 Bush Street: a large meal, half a bottle of wine and coffee. Usually he would read while he ate. Sometimes in the afternoon he would go for a walk, or loiter near Oakland Ferry. At around 4:30PM he would return to Bush Street and writes letters or work on his writing. At 6PM he would go back to the coffee house he went to each morning and have another coffee and roll. In the evenings he would read and write before going to bed at 11:00 or 11:30PM. (Letter from RLS to Sidney Colvin, 18 January 1880, The Letters of Robert Louis Stevenson, ed. by Bradford A. Booth and Ernest Mehew, vol iii [New Haven: Yale University Press, 1995], p. 47). The emotional strain soon took its toll on Stevenson’s health. Although no letters seem to have survived from the period, it seems that in February RLS became very ill. In mid-March he moved to the Tubbs Hotel in East Oakland. Here, he haemorrhaged and was distressed by rotten teeth. Fanny took him to her cottage on 11th Avenue and 18th Street, East Oakland. Fanny nursed him through his illness, also arranging for the removal of his teeth by a local dentist and false teeth replacements. (“The Old and New Pacific Capitals”, The Works of Robert Louis Stevenson, Swanston edn, vol ii [London: Chatto and Windus, 1911], p. 164). On 22 May the couple left for their honeymoon (see the section above, devoted to the Napa Valley). They returned to San Francisco in late July, taking rooms at 7 Montgomery Avenue . The Stevensons stayed here until 29 July, when they took the train from San Francisco to New York. They left for Liverpool on 7 September, arriving on the 17th. Despite the turbulent emotions of his stay in San Francisco and his poor health, RLS was still busy writing. He continued to work on The Amateur Emigrant, wrote “Memoirs of Himself”, the poem “Requiem”, a draft that would later become Prince Otto, and a play, A House Divided. After spending the winter in Saranac Lake and the spring in Manasquan, new Jersey, RLS returned to New York. At Manasquan he had been finalizing plans for his cruise of the South Seas on board the yacht Casco. On 2 June 1888 RLS, his mother, Lloyd, and the maid Valentine Roch took the train to San Francisco (via Chicago and Salt Lake City – Fanny joined them at Sacramento). The party arrived in San Francisco on 7 June. RLS’s health was poor again, and from 7-26 June he stayed at the Occidental Hotel under the care of his doctor. On 26 and 27 June RLS stayed in the Casco in San Francisco Harbour. The party left San Francisco for their seven month cruise of the Pacific Island on 28 June. RLS would never return to the United States. To find out more about the cruise of the Casco, see the page devoted to it in the Footsteps section of the website. San Francisco celebrates its association with Robert Louis Stevenson. His lodgings on Bush Street are marked with a bronze plaque. 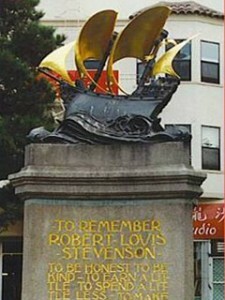 A memorial to RLS stands in Portsmouth Square, part of San Francisco’s Chinatown. RLS himself wrote about the city’s Chinatown, long before the memorial was erected: “Of all romantic places for a boy to loiter in, that Chinese quarter is the most romantic. [. . .] And the interest is heightened with a chill of horror. Below, you hear, the cellars are alive with mystery; opium dens [. . .] the seats of unknown vices and cruelties, the prisons of unacknowledged slaves and the secret lazarettos of disease” (“The Old and New Pacific Capitals”, The Works of Robert Louis Stevenson, Swanston edn, vol ii [London: Chatto and Windus, 1911], p. 163-64). Colour photos courtesy of Alan Marchbank. Black and white photo and Silverado Squatters image courtesy of the Writers’ Museum (The Edinburgh Museums Service).